Community Blog by VGFreak1225 // How Mario can teach a lesson in Characterization. Gaming has become varied to the point where almost any kind of experience can be replicated or adapted to interactive entertainment. We have reached the point where the medium includes space operas, war stories, and even satires involving gamers themselves. Along with those new forms of gaming come new characters, but it seems like for every character that we, as gamers, can relate to, there are just as many that end up not quite hitting the mark. Developers always want the player to like and relate to the characters, and all too often they end up failing because the player just can't relate to them since our objectives and reasons for continuing the quest aren't the same as the protagonist's. Which is ironic considering that an italian plumber pretty much nailed it all so long ago, and still does today. As far back as the original Super Mario Bros, Mario has been chasing after Princess Peach and her kidnapper. The simplistic concept has remained more or less unchanged over the course of the entire franchise and nearly every Mario platformer has kept the same core storyline SMB2 notwithstanding. Peach is kidnapped, Mario saves her. By this point it would be easy to poke fun at it and call it lazy and almost pointless. Now this doesn't sound like something that the player can relate to, and it really isn't. But in the end, the storyline itself isn't as important so much as what it enables. In reality, Peach getting kidnapped is an excuse to explore the Mushroom Kingdom, allowing Mario to see the various locales and do all the platforming that Nintendo creates so well. But most importantly, he does it for the same reason the player does it: its pure, unbridled, uncomplicated fun. When Alex Mercer in Prototype does his thing, the player is more often then not enjoying the chaos that he leaves in his wake, tearing limbs off and killing enemies in brutal fashion. But in the meantime, the game tries to convince you that its all for the greater good. Alex is doing all these horrible, monsterous things out of being the hero. Its all more than a little ironic. But Mario doesn't have that problem. He laughs and smiles throughout all of his adventures. Every "Yahoo!" is a shout of joy at what is happening on-screen. 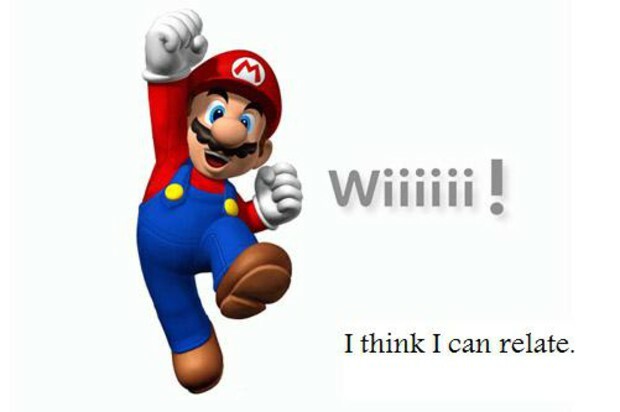 In this way, he is relating to the player and he is experiencing the same emotions the player is, and the same emotions all the Mario games have been able to create: fun. Even though Mario may not have a particularly interesting backstory or a unique personality, he is the player's vessel and he knows what the player wants and what the player is supposed to feel. In this way, you could argue that Mario is a stronger character than Alex Mercer, or Marcus Fenix or any other character that whose motivations are torn in such a fashion. I'm not suggesting every game should have the same focus as Mario, but I do think that if developers want to start creating likeable characters, they should first remember why the player is playing the game in the first place. Let them be happy, or let them want to blow stuff up or even let them accept the fact that they are a truly horrific monster. But always, always make sure the player can relate.